Front Nine: A Biography of Place explores not only the mystery of the Newark (Ohio) Earthworks, but also the subsequent layers of history, which have accumulated there. 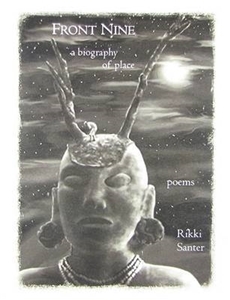 Santer's poems evoke both the wonder of the mounds and her curiosity about the country club whose efforts have preserved this earth structure for more than a century; about a Midwestern town which has absorbed the presence of an ancient people into its character; about contemporary native people's connection to the place; and about the archaeologists working to solve its mystery. Poet Kathy Fagan writes that Front Nine tells "a great American story of native artistry, human ignorance, historical plunder, and ultimately-in Santer's hands-aesthetic recovery" that is both unique to its place of origin and emblematic of our nation's real and complete history. Front Nine has been praised by Bradley Lepper, Curator of Archaelogy at the Ohio Historical Society, and by Ohio State University professor Stephen Kuusisto, author of Planet of the Blind. Kuusisto writes that Santer "brings forward true lives, steep loves, exquisite human and natural histories. Her work is sustained by what I can only call 'Planetary Faith.'" Front Nine features illustrations by Marc Ross based on historic maps, prehistoric artifacts and the game of golf, which provide a striking visual echo of Santer's poems.